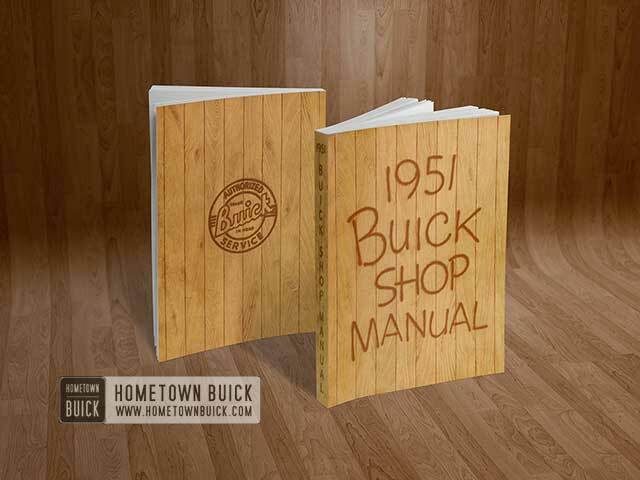 The following procedure must be used to center the engine in the frame and adjust the 1951 Buick engine mountings and transmission mountings. Tighten 1951 Buick engine mounting brackets to the crankcase and frame front X bar. Loosen the engine front mounting pad top stud nuts. Measure the distance between the front edge of crankshaft balancer, at horizontal centerline, and the center of the nearest shock absorber bolt head on each side. If distances on both sides are not equal, shift front of engine sidewise as required to center engine in frame, then tighten engine mounting pad stud nuts securely. 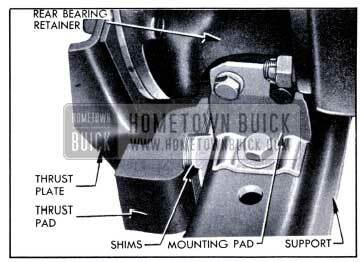 The mounting pad stud holes in 1951 Buick engine mounting brackets are oversize to permit sidewise adjustment of engine. 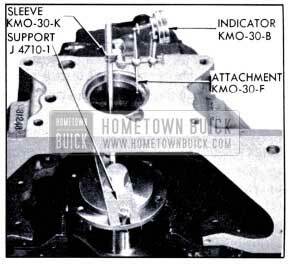 With engine and transmission resting freely and normally on 1951 Buick mounting pads, install sufficient shims between the thrust pad and transmission support to snugly fill the existing space. Insert shims from above, with tabs on right side in Synchromesh cars or left side in Dynaflow Drive cars. See figure 2-40. Flywheels are attached to the crankshaft with bolts, lockwashers and nuts. It is necessary to remove the crankshaft rear bearing cap and remove bolts from crankshaft in order to remove the flywheel. CAUTION: When turning crankshaft with rear bearing cap removed, hold the bearing inner oil seal to prevent it from moving out of the groove in crankcase. Attach Indicator Support J 4710-1 to flywheel with two flywheel bolts. 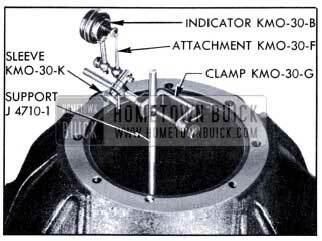 Mount Dial Indicator KMO 30-B and Hole Attachment KMO 30-F on pilot with Sleeve KMO 30-K. Adjust ball end of hole attachment to bear against side of pilot hole in flywheel housing. See figure 2-41. 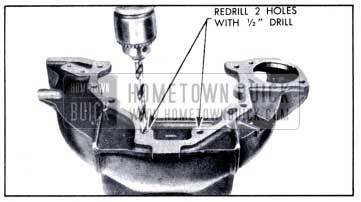 Drill out the two upper bolt holes in flywheel housing and the four bolt holes in crankcase flange with a 1/2″ drill. See figure 2-42 and 2-43. 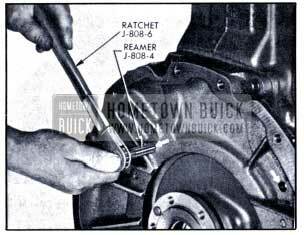 Using Special Reamer J 2548-3 and Ratchet Wrench J 808-6 (shown in fig. 2-48), ream the dowel holes and install two oversize dowel pins J 808-5. To balance the flywheel, insert one clutch cover bolt successively in each hole in flywheel and check results at each position by running the engine. It may be necessary to vary the test weight by adding washers or by using a shorter bolt. When a proper weight and position has been found to eliminate the vibration, the bolt will be on the light side of flywheel. Remove the bolt and drill shallow holes in diametrically opposite side of flywheel, until enough weight has been removed to make engine run smooth. Use a 3/8″ drill and do not drill any hole more than 1/4″ deep. Remove Dynaflow transmission (par. 4-27) then remove flywheel and flywheel housing. Mount the new flywheel housing on engine crankcase and tighten attaching bolts. Do not install dowel pins. 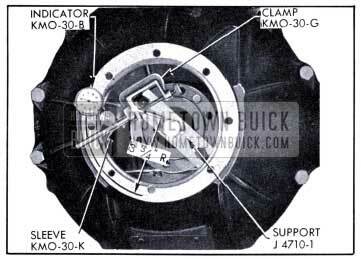 Attach Indicator Support J 4710-1 to crankshaft flange with two opposite flywheel bolts. See figure 2-45. Remove bell housing from the transmission and attach it to the flywheel housing. Mount Clamp KM0-30-G and Dial Indicator KM0-30-B on the indicator support so that dial indicator bears against rear face of bell housing at a radius of 3 3/4″. See figure 2-45. Turn crankshaft with an extension and 1″ socket applied to hex of indicator support, making certain that end thrust is held in one direction. Note dial indicator reading as crankshaft is turned; runout of rear face of bell housing should not exceed .005″. If runout exceeds .005″, shellac paper shims of proper thickness in place between flywheel housing and engine crankcase to give an indicator reading of .005″ or less. Mount Dial Indicator KM0-30-B, Hole Attachment KM0-30-F, and Sleeve KM0-30-K on Clamp KM0-30-G so that hole attachment bears against inner edge of pilot hole in bell housing. See figure 2-46. If runout of pilot hole exceeds .004″, loosen flywheel housing bolts just enough to permit shifting of housing by tapping with a lead hammer. Tap in required direction to bring runout of pilot hole to .004″ or less. Tighten mounting bolts and recheck runout. If it is not possible to move flywheel housing far enough to obtain specified alignment, remove both housings. 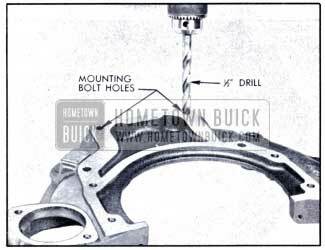 Drill the two plain bolt holes in flywheel housing and the four plain bolt holes in crankcase with a 1/2″ drill. See figures 2-43 and 2-47. Reinstall both housings and align bell housing at pilot hole as specified in Step 9. Remove bell housing and ream the two dowel pin holes through flywheel housing and crankcase flange, using 17/32″ Reamer J 2548-3 and Ratchet J-808-6. See figure 2-48. Install oversize dowel pins J-808-5. Install flywheel on crankshaft and check runout of rear face (par. 2-36, b). Install bell housing and converter on transmission (par. 4-38, i) then install transmission (par. 4-28). Cracks around the outer edge of crankshaft bolt holes in flywheel indicate either a faulty flywheel or misalignment between the engine and Dynaflow transmission. Misalignment between engine and transmission may be due to misaligned flywheel housing, bell housing, or primary pump hub. 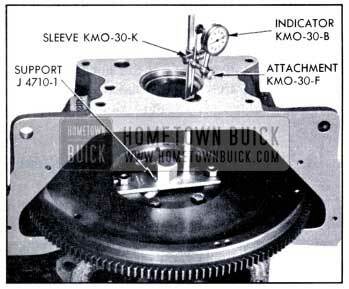 To determine cause of misalignment, check runout of rear face of bell housing and runout of bell housing pilot hole as described in paragraph 2-35. If runout is not within specified limits, correct the alignment as instructed in that paragraph. If runout of bell housing is within specified limits, install a new flywheel (subpar. 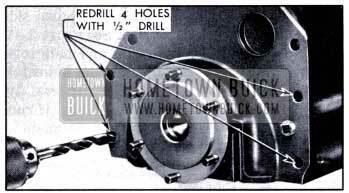 b, below) and then check for runout of primary pump hub as described in paragraph 4-37. If pump hub runout is within limits it may be assumed that the flywheel was faulty and flywheel replacement will correct the trouble. When a cracked flywheel is discovered, a close inspection should be made of the primary pump hub, front oil pump bushing, and front oil pump seal to determine whether these parts have been damaged. Remove Dynaflow transmission (par. 4-27), then remove flywheel. When installing a new flywheel, it is necessary to ream the two dowel holes to avoid deforming the flywheel when it is bolted to the crankshaft. Use a tapered reamer and remove only enough metal from dowel holes to obtain a snug fit of flywheel over the crankshaft pilot and dowel pins. CAUTION: Flywheel must not be forced over the crankshaft pilot and dowel pins. Install flywheel and tighten bolts evenly to 50-55 ft. lbs. torque. Install one 7/16″ cylinder head bolt in upper hole in flywheel housing. Clamp a strip of .005″ shim stock or spring steel to the bolt so that free end bears against face of flywheel so as to cover the holes and provide a smooth indicating surface. See figure 2-49. Attach Clamp KM0-30-G to flange of flywheel housing and use Sleeve KM0-30-K to mount Dial Indicator KM0-30-B to bear against the strip where it contacts flywheel face. See figure 2-49. Turn flywheel, making sure that crankshaft end thrust is held in one direction, and note runout of flywheel face. Runout should not exceed .008″. If runout exceeds .008″ attempt to correct by tapping high side of flywheel with mallet. If this does not correct runout remove flywheel and check for burrs between flywheel and face of crankshaft flange. Remove burrs and recheck for runout. If no burrs exist install a new flywheel and recheck runout. If runout still exceeds .008″, check runout of rear face of crankshaft flange. After installation of transmission, test for engine vibration. If vibration has been introduced by installation of new flywheel make correction as described below (subpar. d). Installation of a new crankshaft, with either the old flywheel or a new one, will require reaming of the dowel pin holes and installation of oversize dowel pins. After crankshaft is installed, check crankshaft flange and flywheel to make certain they are clean and free of burrs, then install flywheel with dowel pin holes aligned and tighten the six bolts securely. Check runout of flywheel face as described above (subpar. b). Remove crankshaft rear bearing cap to provide reamer clearance and turn crankshaft so that a dowel pin hole can be reamed. Ream both dowel pin holes through flywheel and crankshaft flange, using Reamer J 2548-3 (shown in fig. 2-48). Provide two dowel pins 17/32″ diameter by 9/16″ long, either by sawing pieces from 17/32″ drill rod or by cutting dowels J-808-5 to 9/16″. Avoid marring outside surface of pins during cutting, and round the ends with a mill file to remove burrs. Tap the two dowel pins through flywheel and flange until ends are flush with rear face of flywheel. Install crankshaft rear bearing cap and complete the assembly of engine and transmission. Check for engine and transmission roughness or vibration and make any corrections required as described below. Complete production engine assemblies are dynamically balanced to very close limits; consequently, some cases of vibration may be encountered when replacement crankshafts or flywheels have been installed. The following procedure should be used to correct vibration due to change of balance. Remove bell housing cover and bell housing hand hole cover. Install one balance weight No. 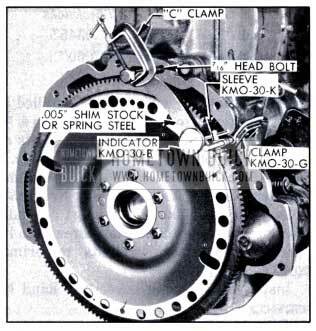 1337197 (.060″ thick) under heads of the two primary pump to cover bolts which are immediately to left (clockwise) of one converter to flywheel bolt. See figure 2-50. Tighten bolts to 30-35 ft. lbs. torque. Place shift control lever in Parking (P) position, start engine and check vibration at critical speed, then stop engine. 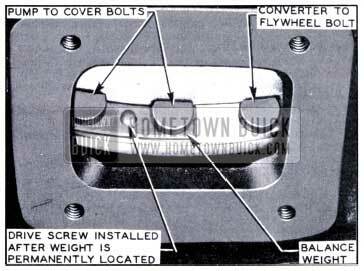 Remove the balance weight and install under two bolts immediately to left of the adjacent converter to flywheel bolt. Tighten all bolts to prope1• torque. Run engine at critical speed and check vibration. Repeat until weight has been installed to left of all six converter to flywheel bolts, in order to determine which location of balance weight produces the least vibration. After balancing weights are installed and all bolts tightened to proper torque, use a 5/32″ drill to spot the center of hole in weights and drill flange of primary pump with a No. 32 (.116) drill, making hole only 3/8″ deep in flange. Select drive screw, Group 8.978, No. 145067 (3/8″ long) or No. 450543 (1/2″ long) depending on thickness of weights and tap screw into hole to permanently attach weights to primary pump. Install bell housing cover and hand hole cover. NOTE: If a satisfactory balance cannot be achieved the new part which caused the unbalanced condition should be replaced and the above procedure repeated.